It was a dark and stormy night…and snowy! And well below freezing… outside the back door little cat footprints appeared in the snow. They led from the door, across the back porch, down the 4 stairs and across the parking lot, terminating under a parked van. With a little coaxing a creature of indeterminate color crept out from beneath the vehicle. The color of the eyes was unequivocal—bright green! And then the moist pink nose! We would never know how long Green-eyes had been roaming the streets and alleys of Madison. But it was obvious that the waif was truly starving—for both food and affection. A small shelter was fashioned on the porch, and we fed the bony and raggedy creature. She (how could such pretty green eyes belong to anyone else but a She?) vacillated between crowing for more food and scrambling up our legs to be petted. 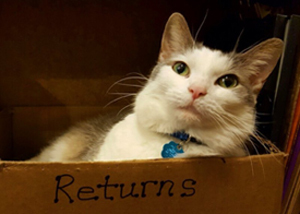 When the temperature plummeted to well below zero, the decision was made to bring her inside in time for Christmas, 2014—Village Lights Bookstore would have three bookstore cats. Gerrrtrude would have her Alice. Footnote to the footnote: After a much-needed bath Alice’s true colors were revealed: a lovely soft grey-brown tabby on a brilliant white background.